Smart World Time is cool world time zone clock designed to display the local Date&Time in any Timezone or Location around the world. It supports the time searching over 1430 cities and towns, in 252 individual time zones, across 240 countries. Timezone Expert is a world time zone clock software. Allows you to add two or three or more different time zone clocks to display in taskbar. A user configurable world Clock that can display a number of clocks in different time zones. 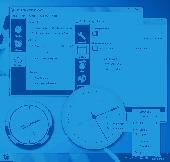 As well as changing the label and Timezone of each Clock, the user may change the background colour and the text colour to suit their individual tastes. A world map can be displayed and optionally the world time zones, and current areas of day and night can be superimposed on this map. Project Clock Web is an easy to use web based multi-user project time tracking system. Proj Clock is a useful application for consultants, lawyers, engineers or anyone else who must record time billed to different projects.